#4158 wears blue and white color of Cherryvale High School Chargers colors. WAMX 928: Ex-Titan Ry. Service 149? WAMX 3810: < HLCX 3624? 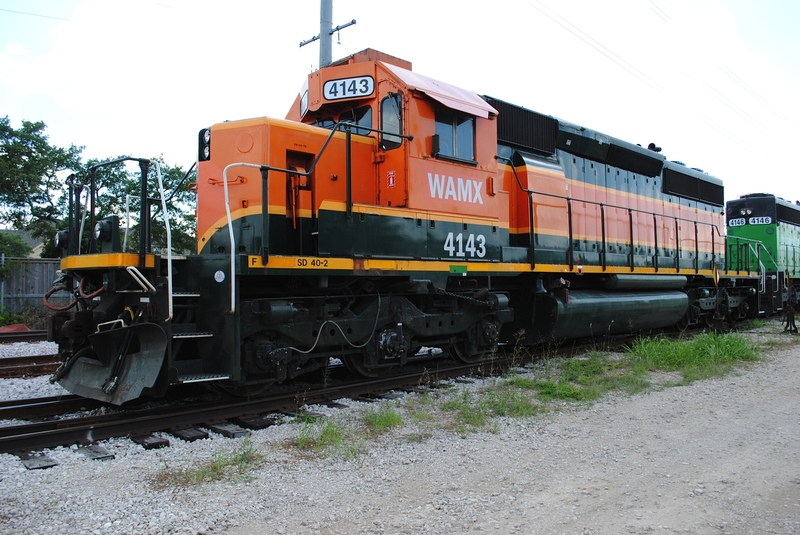 WAMX 7001: < WATX 17/ATSF? WAMX 7002: < WATX 18/ATSF? Following units have been sold to National Railway Equipment for scrap: 108, 908, 3001, 3007, 3008, 3023, 3847, 7026, 7103, and 7105. EIRR 6525(WAMX 4504) was scrapped, March 2005. Additional information/updates by: Michael Bartels, Martin Baumann, Simon Belanger, Shane Darst, G. Gerard, Terry Hanson, Zack Hilton, Randy Keller, John Komanesky, Anthony Maass, Keel Middleton, James Mischke, Brad Moyers, Mark St. Aubin (via LocoNotes), and Ed Weisensel.